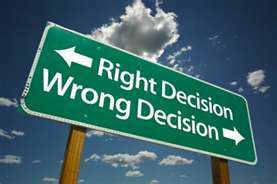 Spiritual truths and lessons come our way via many different means. As I continue my pilgrimage around Ireland I am becoming more aware of this fact. I would like to share three spiritual truths I have gained in the past two days … none of which were spoken. The first spiritual truth was gained at Glenstal Abbey. Glenstal is a Benedictine monastery of around thirty-eight monks. If I remember Fr. Cuthbert (the cellarer of the community and our pilgrimage group’s guide) correctly, the monastery began in the mid-1800’s when a landowner’s estate was purchased and given to the community. Even though built in the 1700’s the estate was constructed to resemble a twelfth century fortress. Currently the monks run a boys’ boarding school that will soon be made co-ed. Fr. Cuthbert shared that the school is currently ranked first in the country. On the main lawn of the complex (in between the school and the monastery) stands a statue of St. Benedict and to his mouth is pressed his right index finger. I have seen this image at every Benedictine monastery I have visited and the lesson is the same: in silence and contemplation is found a sure pathway to God. Benedictine monasteries live this truth so much so that even the very physical space of every monastery (at least the ones I have been to) seems shaped by the value of silence and not just silence as the absence of noise but silence open to and even pregnant with the presence of God. We need this silence in our lives. St. Benedict and all his monastic sons and daughters teach us this truth. We might not be able to live at a monastery but each of us can seek for and even build this type of silence into our lives. We can step away from the computer and turn off the music and television. We can step away from a relentless string of activities and projects. We can build time enriched by prayer and Scripture into our daily routines. If we take St. Benedict at his “hush” then we will be blessed for it. The apparition of Our Lady of Knock appeared on August 21, 1878. For two hours an image of Our Lady appeared on the outside wall of a small, rural parish. 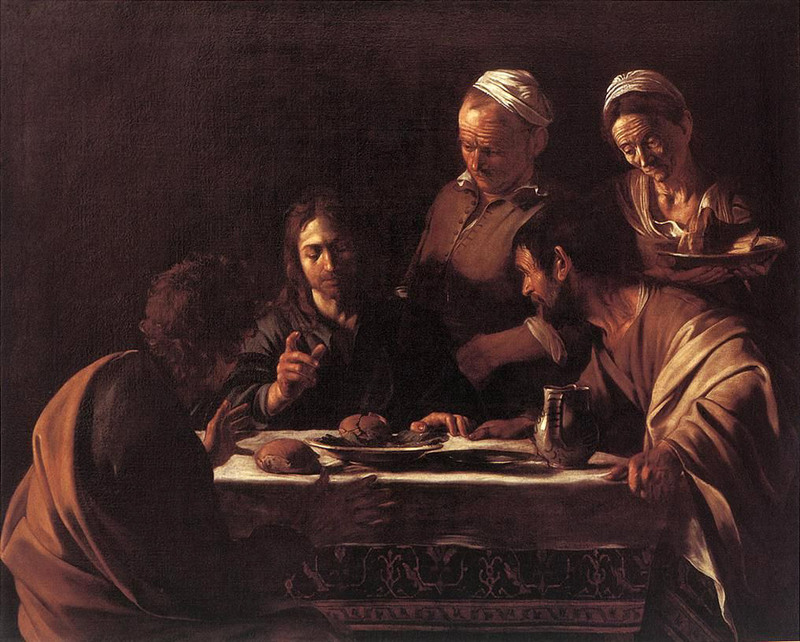 The Blessed Mother was accompanied by St. Joseph and St. John the Evangelist. In the vision she gazed upon on altar on which stood a lamb. 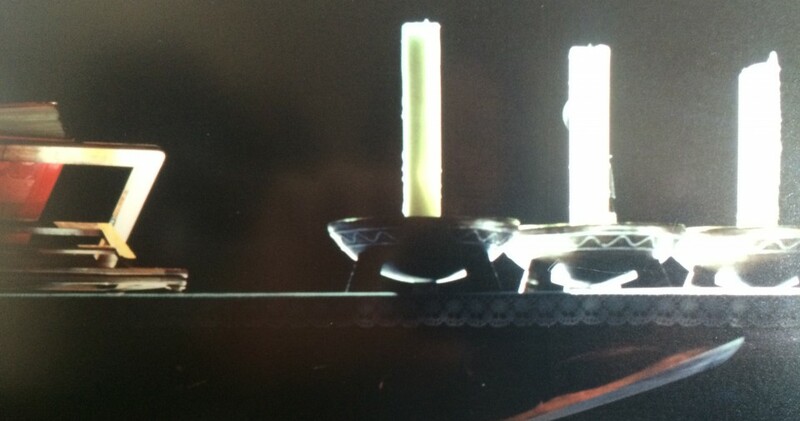 Behind the altar stood a large cross and around the altar and lamb shimmered angels. Fifteen people testified to witnessing this vision and the Church has accepted their testimony as valid. 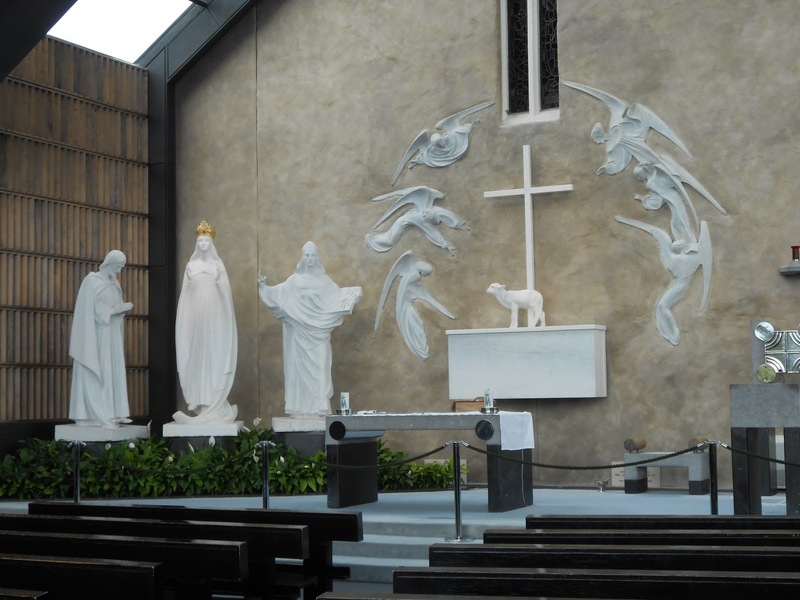 Although not as famous as Lourdes, the Shrine of Our Lady of Knock brings pilgrims from around all of Ireland and also all the world. Today it is a beautiful complex and place of prayer. I must admit that I have been pretty ignorant of this apparition of our Blessed Mother until my visit to the shrine today. Mary did not speak during this vision. What she did though was gaze upon the Lamb upon the altar. Mary always points to Christ and some have speculated that this apparition, which came after the great famine which truly decimated the country of Ireland, was a gift of hope to this poor and suffering people. Christ is the lamb of sacrifice who has taken on all the sufferings of our world. 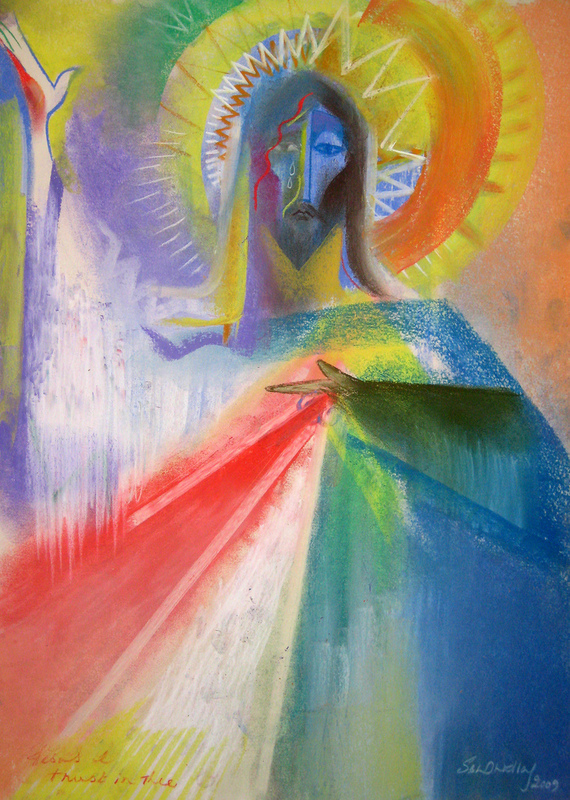 In the midst of our sufferings and even the most unjust pains of our world we can find comfort and consolation in the witness of our Blessed Lady – someone fully acquainted with suffering – and know that our sufferings are not lost to an impersonal and uncaring universe but are somehow caught up in the very dying and rising of Christ. The Abbey of Ballintubber has been called the “Abbey that refused to die”. Located on a site where St. Patrick was reputed to have baptized people and a small church was established; the abbey itself was constructed in 1261 A.D. Despite King Henry ordering all abbeys and monasteries closed in 1542 A.D., Oliver Cromwell destroying most of the structure in 1653 A.D., the penal times when the Catholic Church was outlawed in Ireland and the Great Famine, the Eucharist has continuously been celebrated at the abbey since its founding in 1261 A.D. Even when there was no roof on the structure, people would still gather for Mass and the celebration of their faith. 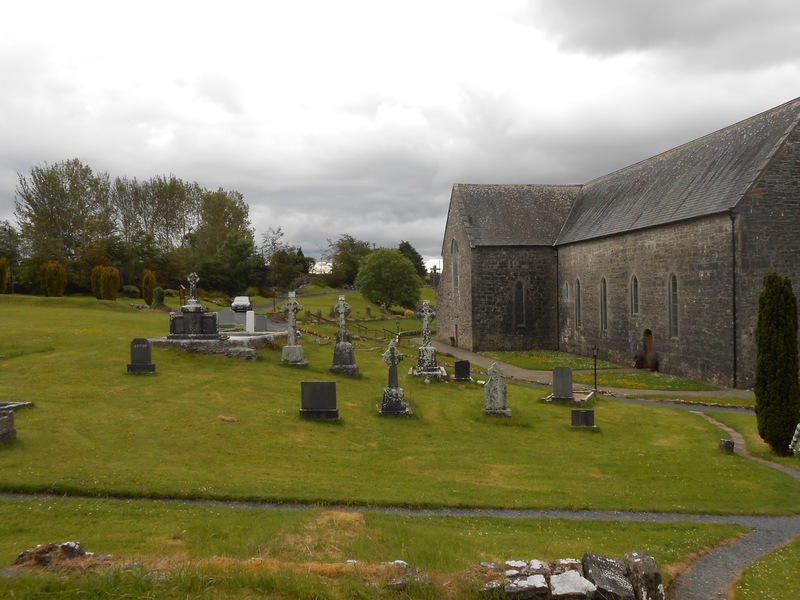 As with all churches and ruins of churches in Ireland (because they are considered holy ground), the Abbey of Ballintubber is surrounded by a cemetery. All the graves face east. They face the rising of the sun and, by this, give silent witness to our Christian hope in the great day of resurrection. These countless graves and indeed the very witness of this “abbey that refused to die” teach us that there will be a day of resurrection and that all wrongs will be righted and that we, as Christians, live by hope and not resignation. We live our lives today already in the dawning light of the great day of resurrection! Lessons offered quietly and in truth. They speak to our hearts and they bring comfort, consolation and hope. Glendalough is a glacially-formed valley in Ireland that is within an hour’s drive outside of Dublin. The name means “glen of the two lakes”. The glen is remarkable for its peacefulness and beauty. 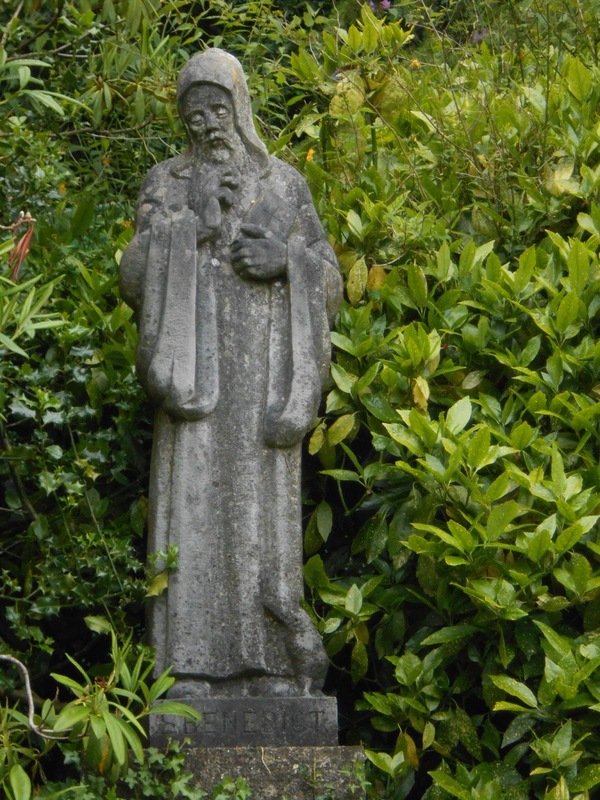 In the sixth century, St. Kevin arrived in the glen seeking a life of prayer, penitence and contact with nature. The reputation of the holy man grew and other people came to the glen seeking Christian community. A monastic city grew and thrived there for centuries. Scholars estimate that at its height around one thousand souls lived within the monastic city with non-monastics (merchants, tradesmen, etc.) living outside its walls and pilgrims arriving continuously from all over Ireland and Europe. The monastic city became a center of faith, learning, peace and life within the dark and often violent times of the middle ages. The city was destroyed around 1368 A.D. by British troops and now all that is left are the stone ruins of a once thriving faith and cultural center. Today, as I toured Glendalough and learned its history, I was reminded of the stunning mosaic above the main altar in the Basilica of San Clemente in Rome. In the center of the mosaic is the cross of Christ and from the cross sprouts branches calling to mind the saying of Christ that he is the branch and that we are the branches and that the cross is indeed the “tree of life”. Within the twists and turns of these branches are found different images of culture and life: artists at work, people performing music, laborers, people learning and many more such images. The mosaic testifies that life flows from the cross of Christ and that it is life that both transforms and builds culture. The monastic city of Glendalough was a living testimony of this truth. In a savage and brutal time a man began a community that, informed by the Christian faith and the light of the Gospel, developed learning and truly aided humanity. I would say that Ireland and in fact all of humanity is in a better place because St. Kevin and his followers took the light of the Gospel seriously and, by so doing, raised the human condition. 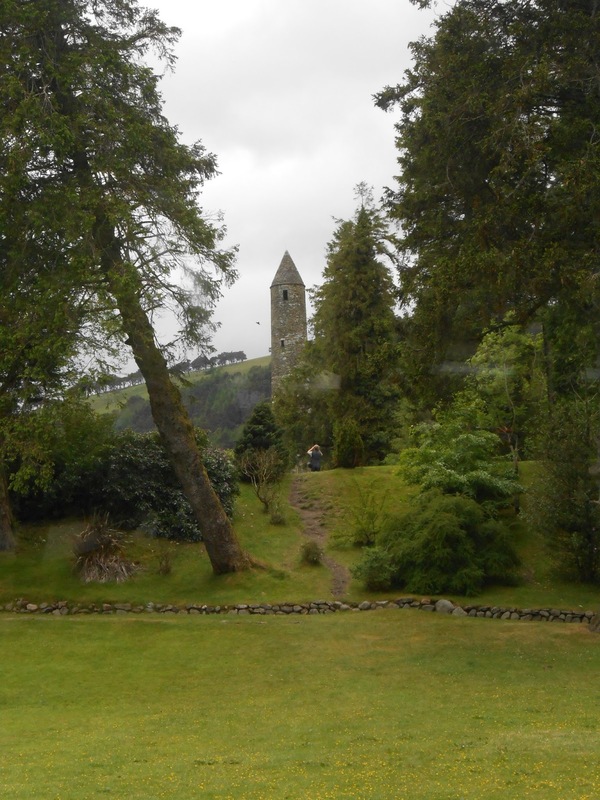 The monastic city of Glendalough and the mosaic of San Clemente remind us that Church and faith build culture. This is an important memory for Christians as we live in a time steeped with revisionist history and agendas seeking to cast the Catholic Church solely in negative and demonizing terms. These tendencies portray the Catholic Church as an impediment to human progress rather than the catalyst that it has historically been and also continues to be. History records that St. Kevin’s faith, and the vision of the monastic city, brought light and hope to a truly dark and dangerous time. This is just one example of a multitude throughout history and around the world. We, as Christians, must be prepared to do the same today. I would even go so far as to say that we cannot but do so because it is within the very makeup of who we are. The mosaic of San Clemente demonstrates this almost organic connection between the proclamation of the Gospel and the growth of human learning, light and hope. God is the source of all knowledge, light and truth; therefore, to encounter Christ is to encounter truth and light. It is easy to tear down. It is not easy to build. The Christian faith builds culture and life and this work shines forth even more brilliantly and truly when the surrounding ethos has nothing to truly offer the deepest yearning of the human heart. Does this mean that we need to seek out our own Glendaloughs and retreat from the troubles of our age? First, I would say that some men and women are called to the monastic and eremitic witness but not the majority. Second, I would say that St. Kevin and monastics and hermits of all times do not “hide away” from the human condition but rather, have the courage, guided and impelled by grace, to enter fully into the human condition. The community founded by St. Kevin became a faith and cultural center precisely because it grew into a community of authentic humanity. A “growth” made possible by the light of the Gospel. The Gospel leads to true humanity; the “world” (despite loud protestations to the contrary) is what often fears the human condition. What do we Christian do in this age and every age? We cling to the light of the Gospel and we allow this light to develop an authentic humanity that is clearly distinguishable from the shallowness of a worldly ethos. The Christian monastic living in a monastery separated from the rush of the world is called to do this as well as the Christian disciple living in the non-stop movement of a major city. The light of the Gospel leads to an authentic humanity which, in turn, creates a human space where life can be found and true friendship can be encountered. Today, we each need to be a “St. Kevin” – trusting in the light of the Gospel and living an authentic humanity. This Sunday, as the Church celebrates the Feast of the Body and Blood of Christ (or Corpus Christi), I would suggest this request of the two disciples as a way of exploring this holy mystery of the Eucharist at the heart of the life of the Church. Secondly, notice that it implies relationship. Our awareness of the mystery of the Eucharist grows as our relationship with Christ as Lord and Savior grows and our lived acknowledgement of Christ as Lord and Savior grows just as our humble entering into the mystery of the Eucharist increases. Relationship is a lived reality, it is a give and take exchange. 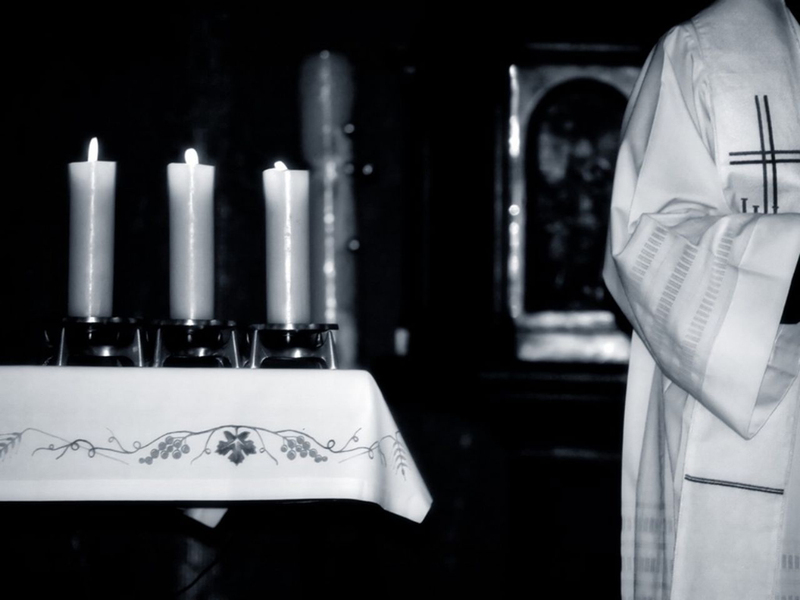 The mystery of the Eucharist (like any relationship) cannot be “proven” from the outside. It must be entered into, in order to be encountered and experienced. This “entering into the mystery” is not just a matter of filling a spot in a pew on Sunday either. It is a dynamic of the heart and the heart’s willingness to enter relationship. The breaking of the bread and Christ giving himself in the form of bread and wine occurs on the road. The Eucharist is often referred to as “bread for the journey”. While in this world – as individual pilgrims and as church – we are always on the journey. We are on journey toward the Kingdom of God and beyond that which holds us bound. The Eucharist is not prize for the victor who has won solely on his or her own abilities rather, it is food for the pilgrim on the journey, who often stumbles and who can even take wrong turns and get lost sometimes. We need the Eucharist. We need it’s transforming grace. The Eucharist nourishes and refreshes us from the struggles of life. The weariness of life can be heard in the request of the disciples who just had their hopes dashed by the cross on Calvary. “…it is toward evening and the day is far spent.” In a truly divine way, the Eucharist nourishes and refreshes us as we also encounter the pains and struggles of life. The subtlety of the Eucharist is one of the great paradoxes and stumbling blocks in the eyes of the world. In the simple receiving of what appears on the surface to be only bread and wine the very life of God is given to us and received by us! God’s power is revealed exactly in not having to act through flash and show but rather in giving of Himself in a subtle presence. A discerning and maturing heart begins to recognize this. The Eucharist nourishes and opens our eyes to the ways of God. In his first letter to the Corinthians (1 Cor. 11:23-26), Paul recounts what he himself had received and now, what he himself, hands on. 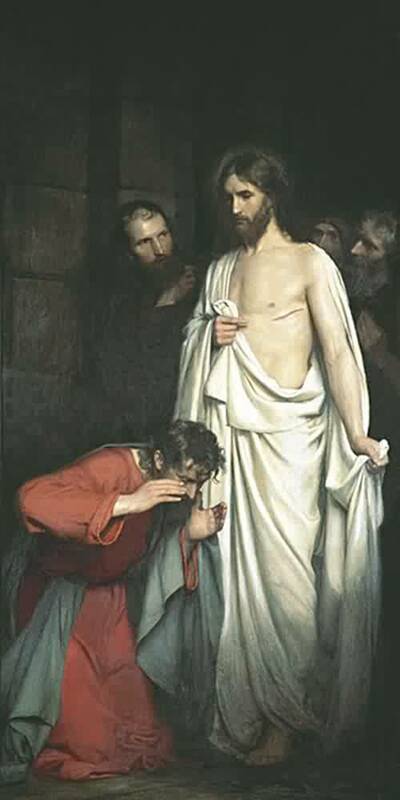 “…that the Lord Jesus, on the night he was handed over, took bread, and, after he had given thanks, broke it and said, ‘This is my body that is for you. Do this in remembrance of me.’ In the same way also the cup, after supper, saying, ‘This cup is the new covenant in my blood. Do this, as often as you drink it, in remembrance of me.” Before the gospels were written, before the canon of Scripture had been codified, before Christianity was legally recognized and no longer persecuted, the Eucharist was being celebrated. The first Christians encountered the living Lord in the breaking of the bread … this same encounter continues today.